To get started with Dashlane on Linux or a Chromebook, you'll need to get our web extension on the browser of your choice. The web extension is a feature-rich version of Dashlane that allows you to manage your passwords as your browse in Chrome, Firefox, or Edge without having to install our separate desktop application. In order to download the Dashlane extension for your favorite browser on Linux, please visit our download page. You will be taken through our web onboarding during which Dashlane will be installed in your browser. Note: For now, the Dashlane extension for Linux is only compatible with Chrome, Firefox and Edge. We're hard at work bringing our extension to a greater range of browsers. Stay tuned! After the Dashlane extension has successfully installed in your browser, you should be automatically prompted to create your Dashlane account. If you already have a Dashlane account, simply click on the 'Log in' button located at the top-right corner of the window. You may check this page for more information on signing in to your account from a new device or browser. If you are creating your Dashlane account, the first thing you will need to do is choose your Dashlane email address and your Dashlane Master Password. Your Master Password is your private key to encrypt all of your data saved in Dashlane. It is like a key to a safe. If you have the correct key, you can open the safe. If not, the safe will remain closed. To keep security as strong as possible we do not store your Master Password. This means if you forget it, we cannot send it to you and it cannot be recovered. 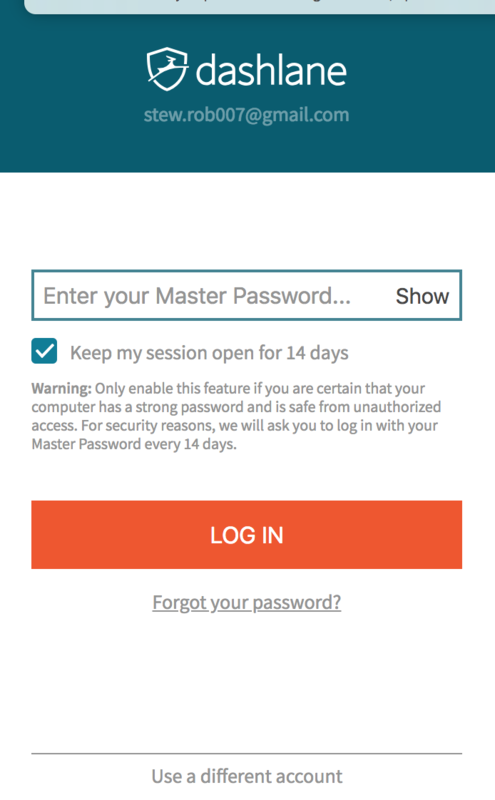 You may refer to this article for more information on what a Dashlane Master Password is, and our best tips to choose one that is secure and easy to remember! Once your Dashlane extension is installed and your Dashlane account created, it's time to start your Dashlane journey! If you followed the full web onboarding referenced above, you should already be logged in to your Dashlane account via the Dashlane extension installed in your browser. If so, the shield icon in your browser toolbar will be outlined in the color teal, as shown below. In order to pull up the Dashlane web app and start using it to manage your account, all you need to do is clicking on the shield icon, and a new window should open in your browser. If the shield icon is grayed out instead, it means you aren't logged in. Please click on it, and a new window should open, allowing you to sign in and start using the Dashlane web app. How to use the Dashlane extension in your browser – browse the web seamlessly and enjoy Dashlane's state-of-the-art autofill feature! You now have the ability to have your extension remember your master password! By default, the extension is set to automatically log you out when you close the browser. To avoid this, you can choose to have the extension remember your Master Password. Note that this is only possible when the device is already registered with your Dashlane account. This option will not appear if it is the first time you log in, or if the device is not registered. Only enable this feature if you are certain that your computer has a strong password and is safe from unauthorized access. For security reasons, we will ask you to log in with your Master Password every 14 days.